Product #17846 | SKU MB_SPLR-BMCC-BM1 | 0.0 (no ratings yet) Thanks for your rating! 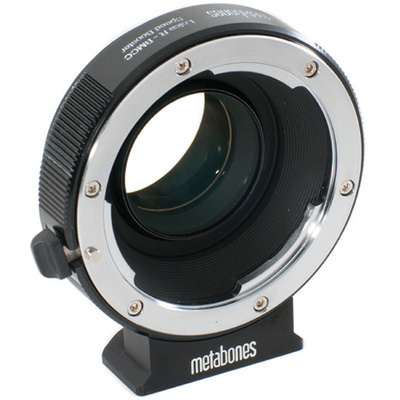 The Leica R Lens to Blackmagic Cinema Camera Speed Booster from Metabones allows you to mount a Leica R lens on a Blackmagic Cinema Camera, while using custom optics to increase the angle of view and the maximum aperture of the lens. The Speed Booster works by shrinking the image circle of your Leica R lens down to better fit the smaller sensor of the Blackmagic Cinema Camera. This has the effect of making the angle of view of the lens 0.64x wider or, in other terms, reducing the crop factor of the camera from 2.39x to 1.53x. This yields an angle of view similar to APS-C or Super 35 sized sensors. When the Speed Booster concentrates the image circle from a lens, the brightness of the image is increased by 1 1/3 stops, with a maximum output aperture of f/0.9 when using a Leica R f/1.4 lens. In addition to lens speed and angle of view, the Speed Booster also increases the lens' MTF, or how faithfully the lens transfers detail from the object to the camera sensor. These increases in MTF are seen in the corners as well as the centre of the images. For added lens support, a removable Arca-type tripod foot is included. Super telephotos such as the Telyt 560/5.6 may vignette at the corners.